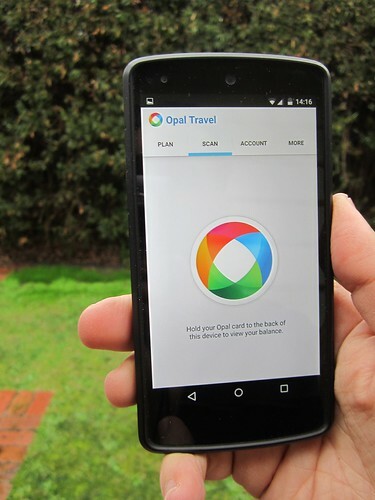 You can check your Opal card balance on a phone. #Myki? Don’t hold your breath. Outside Australia, numerous public transport smartcard systems have apps that let you instantly check the balance of a card using a phone that uses Near Field Communication (NFC). Most such phones are Android, but the Apple iPhone 6 and later also has it. Because the “master record” for this data is kept on the card itself, only checking via NFC can guarantee details that are completely up to date — unlike checking via the web or other apps which can’t read the card (such as Myki Plus* and Pay 24). Reading from the web site means it may take several hours or even longer to update. 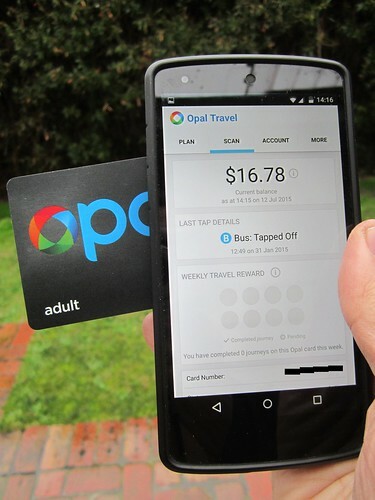 It seems NSW’s Opal Card has just joined the NFC app club… for Android only at this stage, it appears. So I just checked my Opal balance on my phone. Neato. I think Opal is the first Australian public transport smartcard to offer this. How long will we wait for Myki to provide this? The web site has barely changed in 6 years, so I wouldn’t be holding my breath — though the tendering to a new operator for the ticket system may mean we’ll see these types of improvements. Indeed, the operator of Opal, Cubic, is one of the short listed companies to run Myki. Already the Vix-provided gates/readers are appearing at more stations, with response time much more in line with other systems around the world. Just shows how we benefit if the ticketing system is run by a company that actually has some experience at it. Previously on the blog: What can you see on a Myki card by using an NFC app? — not very much. It’s all encrypted. Of course, one should always be cautious about financial transactions such as topping-up your Myki when using an unofficial app. I’d rather stick to the clunky web site, myself. Next → Next post: Sense8’s public transport. Can you name the cities? I’ve been in Sydney this weekend and using the Opal system and app is mind blowing compared to myki. I can use NFC and get my card balance straight away. I’m not looking forward to using myki when I get back. I wish our system could take some inspiration from the Opal system. @Kurt, really? What’s the point of it then? Will only Apple’s own apps support NFC? Apple’s NFC Implementation ONLY works with Apple Wallet. They couldn’t envisage anything beyond a fancy way of paying for things, and they also wanted complete control hence no third party apps. Now that many stations have myki gates that do not show your balance as you touch on/off, it seems reasonable to allow users to check their actual balance on their phones. It shouldn’t be that hard! Having used an NFC app to look at my Opal, Myki and GoCard (ok, i’m a tragic when it comes to collecting transport cards), there is probably zero chance of Myki offering the read feature Opal now does. Look at an Opal card with generic NFC tag reader tools and there are 8 files, one of which is ‘free read’. All files on a Myki (and Gocard) are encrypted. So it would appear Opal was designed from scratch to allow these apps to exist – they provided that unencrypted file containing the information a normal user would like to know. The other cards have no such opening. For Myki such an app would need to know one of the secret access keys to get at the data. It’s probably not a good idea to embed any secrets in an app that 3rd parties might disassemble to see how it works. With Myki reissuing the cards every 4 years, they COULD change the file format, providing a open file like Opal, but given Myki’s track record so far, sending them back in to modify the readers to support this wouldn’t end well.